Would a V50 Stelvio sell? 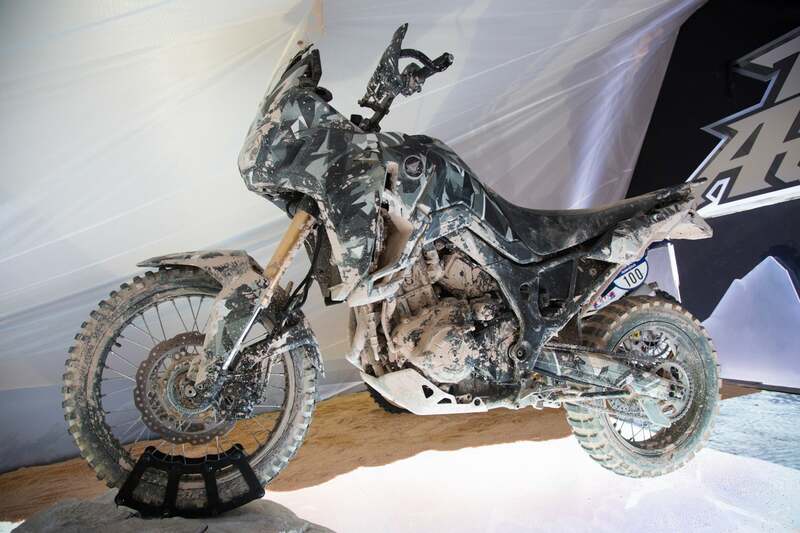 After reading the thread on the 250cc CSC Cyclone adventure bike, maybe light weight adventure bikes are the next hottest thing. 400 lbs and ~$8,000 might be a whole lot easier and fun to handle off-road and on-road than 600 lbs and $16,000 - $20,000. Yamaha could take their SR400 single , bump it back up to 500cc and use it as the basis for a light weight, simple, adv. bike and sell the extras like saddlebags as accessories that you could add anytime. It would introduce riders to that segment for a a lot less money. 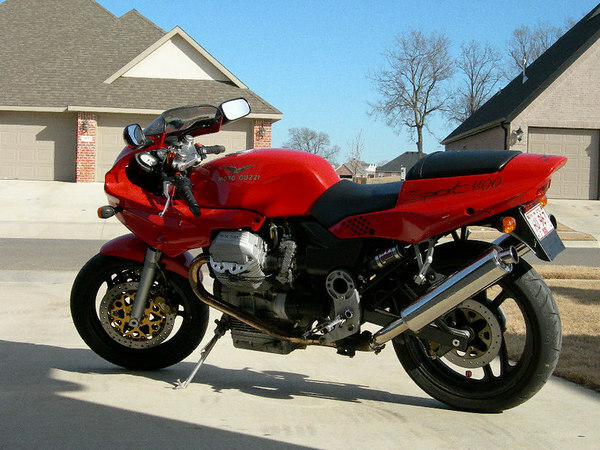 But then again, Moto Guzzi could use their V50 engine and develop it into a lightweight 500cc Stelvio and sell it for under $10,000 and you could add the adv bags & stuff as accessories when you wanted to. Would either of these segments of light weight adventure bikes sell? Re: Would a V50 Stelvio sell? The V50 and V75 engines are the same, the bikes would weigh the same, so why not use the larger displacement engine ? I do like the idea of a small block Stelvio type bike, but I'd want the most displacement and power possible from the engine. The SR400 is already an expensive bike, building anything from it would likely only drive the price even higher. Going up to 500 cc would result in heavy vibration - the same as my old XT500. Kickstart only would be a deal breaker for lots of potential buyers as well. It's a 39 year old design, well past it's prime for anything other than a retro bike. Yamaha would probably be better off making a light-weight adventure bike using the 321 cc twin from the new R3. I would say the 650 Vstrom and now the new yamaha FJ-09 are somewhat in this niche. Maybe in the manufacturer's mind, for smaller displacement, a dirt bike with a bag would get the job done without designing something completely new that may or may not sell. I don't get Guzzi's as ADV and or dual purpose bikes. The exposed sump hanging below the frame is just begging for a rock to be thrust through it. The same could be said for BMW Airheads, yet that's where all this ADV stuff started really. A well designed bash plate is really all that's needed. The OP asked if a Trailed Sr400 or V50 would sell. This general idea has been tossed around quite a bit. On the Guzzi side, if you are going to consider a 500 cc engine you may as well go with the 750cc one since the weight will be very similar and the market will want as much horsepower as possible. Even the current 40RWHP V7 would be tough to market because the specs of the competition offer double that. 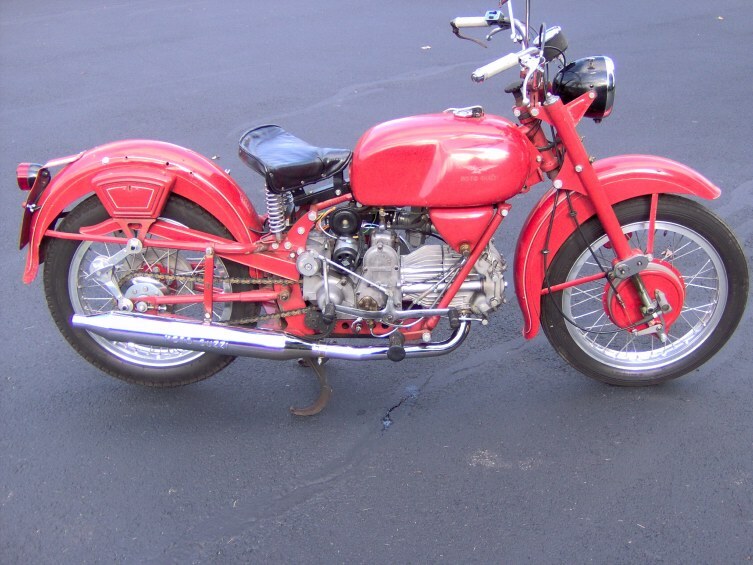 In answer to your basic question, a lighter twin cylinder adventure bike is very attractive to me and other older riders so I think it would sell. I'd want more power and better suspension than what Guzzi has now, both are doable. Heck, slap the Aero heads on the small block and we are almost there. Think KLR when you think Small Block Guzzi ADV bike. Then there will not be a power deficit, just a price tag problem. I think a better question is, could guzzi make a wet clutch? If you're going to be doing some real offroading, I think a wet clutch is the order of business. The small block does have the torque to make a good offroad bike if they could keep the weight down to a minimum, but do we really need another pseudo-adv bike out there? Guzzi would have to make something radical, a bike that really does work offroad, to make a real splash in an already saturated market. Well I think we want: reliability, light weight (400 lbs wet without panniers), around $10K or just north of it, 80 hp. I pushed my Stelvio out cold yesterday to wash it, hoped off it to push it up a off camber hill. Fell over gently in the grass. I couldn't lift it up myself (back facing towards the bike and squatting it up). Is the block on the guzzi's aluminum? Stick to shaft drive.. I'll take a bit of a hit on weight for that. Give me all that and the 1200 Stelvio is gone. But if you can't: I love the brand, the visceral feel and sound of the transverse twin. It feels alive.. I don't want a parallel twin unless you can replicate the visceral sensations. I'd say yes they would, as an adventure (rather than trail) bike. Agree though that you may as well go with the 750 sb for the Guzz and a 500 might be better than 400 for the road components of such a bikes task. It would all depend on styling and probably a more 'retro' look. (on the basis that modern styling is bone ugly) Also, an adventure bike, almost by definition, has to be easy to pack gear onto. I have a full size Stelvio and it's a great touring bike. I'd buy a baby Stelvio that was lighter, smaller and based on the V7II small block. I've gone from looking at the KLR and DR to the Tiger 800xc back to the KLR and so on. I'm intrigued by the V7II Scrambler. It might just fit my need for a light trail/fire road bike. I didn't seriously consider the V7 until I saw that it weighs less than the KLR and also has more hp and torque than the KLR. A sump guard will fix the exposed sump and the shaft drive and v-twin are both winners for me over the KLR and DR single engine and chain drive. I'm setting up my XR650L like that. Wolf man side racks for luggage. Windscreen (still experimenting), dual sport tires. 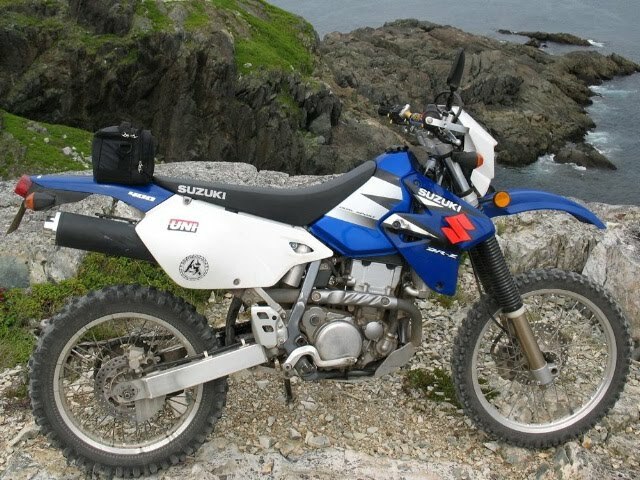 Same hp as the KLR but about 80-90lbs lighter. Good on the road, better off. Seeing where life has taken me, the DRZ would have been a better choice but here I is, with a paid for 650L so I'll stick with it. Would not sell. Not a chance. V7's suspension and ground clearance are two huge limiting factors in its off road abilities. Anything other than very well groomed fire roads are going to be a challenge. I'd say no. two examples why. Nevada and Breva 750.
or even the 390 Naked Duke that will sell for $4,999 with 44Hp. just saw my KTM guy today, they won't have them till late spring. Both produced BEFORE the V7 series, currently Guzzi's best seller. That was kinda my point, probably not expressed very well. Neither of those sold well, especially compared to the V7. I would never ever have thought that a smallblock guzzi would be a hit. I think a mini stelvio would be a step backwards. Let's see- take an already marginally powered bike, then hang all sorts of clunky guards, lights, aluminum suitcases, and endless clunky psuedo industrial ADV farkle crap on it. Oh yeah, engineer in suspension with much more clearance. Alter the frame because the stock one won't do. Sent the whole thing to the designers to make it ugly enough to sell to the ADV crowd. after redesigning everything on the bike with the exception of the too small engine, now figure out how to get the weight down below 550 with all the crap. Now that you've invested all this R&D on an underpowered bike that will try to compete with either BMW, Triumph, or Suzuki- figure out how you can possibly sell the machine for less than $13-14,000. Or, leave well enough alone with a lovely model that just seems to work, is priced right, and is hip enough to be used as a prop in Ralph Lauren boutiques. ...but there might be a market for lighter weight, smaller displacement ADV bike. My daughter Lisa (the one you guys have seen with me at all Guzzi Rallies) is now 16 and has drivers license. She wants a bike and we have started to entertain the thought and see whats available. We dont have a million choises... Kawa 250 Ninja plus few other crotch rockets. However if there would be a underpowered and (light enough) ADV bike, I would consider. V50 would be too much for her, just because of the weight. and for us guys, it would be seriously underpowered bike. But a small 250-350 with lower weight and less of a pricesticker.. I might bite. Right now there is not much to pick from, unless you want a motocross bike. (which defeats the purpose to do gravelroads AND highways. Hey Lauri - que pasa, vato? What about a Suzuki TU250? Very cool bike. The first year red ones were beautiful. I don't know from dual sport bikes today. Seems like anything with enough suspension might be a tad tall for her. I tried Honda Rebel, she does not want a "Harley looking" bike, hahahaha.. I would love to get a Honda 125RR, but not sold in USA and there are no entry level ADV type bikes. Makes no sense to take Ninja into gravel roads. How about a Honda CRF230L, Yamaha XT225 or TW200, Suzuki DR125 or DR200? I am anxiously awaiting the re-introduction of the Honda Africa Twin.